The best leaders I ever worked with cared. I believe when those whom you are leading know you care, they will go the extra mile for you. In every workplace problems arise and some of them require immediate attention with a short timeline to be addressed. When working until midnight is necessitated, those who work with leaders who care roll up their sleeves and gladly work till midnight. On the other hand, when you are working for leaders who are self-centered and care only about themselves and their legacy, there is only one reason you would stay until midnight. If you did not you would lose your job. You would definitely not do so gladly! I have been fortunate to work for some outstanding leaders who truly cared, and unfortunately, for some who led in title only. Their title made them the leader and that was how they led. They were the boss and they had all the answers. You were subservient to them and they made sure you knew your place. The only way I think you can work for the leader who doesn’t care is to convince yourself you don’t work for HIM. You work for the betterment of the school, the business, or the organization. You especially work for the people whom you are leading and you do all you can to serve them. If you are working for the uncaring leader I believe you come to work with one of two emotions – you arrive angry or down. It is not until you accept the fact that you do not work for HIM, but for those whom you serve, that you can come to work with a positive attitude. The only other alternative is to leave. The opposite is true when you work for the leader who cares. You respect and appreciate him or her so much that you don’t want to disappoint. You gladly go the extra mile. One of the greatest leaders I have ever been around was Gordie Gillespie. He had an incredible capacity to care for those whom he led. In his coaching career, we believe he coached somewhere between 4,000 and 5,000 athletes and somehow cared for and loved everyone of them. You had to be there to believe it. It was one of those things you could not put into words, but you knew it when you saw it. Bishop Roger Kaffer had that very same caring attitude. As principal of Providence High School, he visited the homes of every new student to our school – every freshmen and every transfer – annually. I have never heard of any principal ever doing this. He didn’t have to tell anyone he cared; his example validated it. Dr. Jack Orr, as president of the College of St. Francis, made it a policy to attend the wakes of the parents of our students even when he did not know the student. In his capacity as president, he could not possibly know all of our students but he was there for them at one of, if not the most difficult, time of their lives. Leaders who care don’t talk about it; they do it. 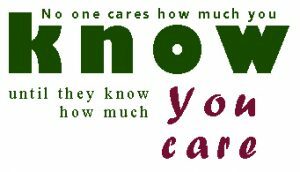 “People don’t care how much you know until they know how much you care.” A concept for leaders to reflect on.